A Mad, Wicked Folly is one wicked powerhouse! Do not be fooled by this books hefty 448 pages. They will fly by quickly and you will be begging for more! I absolutely loved every nook and cranny of this novel's package. Let's start with the stunning and influential characters; Victoria was a lovely character to read and watch grow. We are introduced to her as a young socialite pursuing her dreams in secret, to then becoming a strong independent and brave woman! It was an absolute pleasure to watch her transformation. Waller crafted an outstanding portrait of 1900's London. It it quite a feat to paint such a vivid picture. 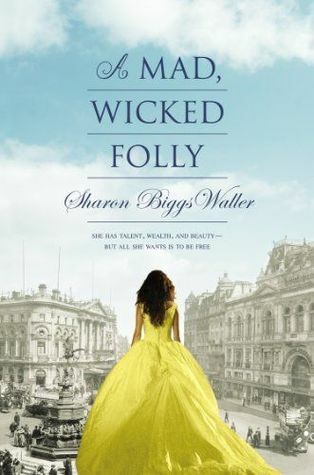 Waller's bold writing style and world building gave me the opportunity to see and smell the London that lay inside these pages, and the beautiful artistic touches in between. It has been a while since I have been so moved by a female main character. She made me want to jump up on my soapbox and give voice to my beliefs and opinions. She was so moving and so very inspiring. I loved every single millisecond of this novel. The entire reading experience is a mad, wicked adventure! Not only does this book look good, but it sounds good too! I will definitely check it out! Okay, you've convinced me. I'm going to read this!